Designed to be an ultra-modern retail destination, construction began on the Helix complex in 1956. The tiered shopping center was set to have a five-star hotel, a park, and floors of luxury shopping. The massive mall would have allowed people to drive their cars right into the complex and park near the shops they wanted to visit. Built on a pre-existing hill in Caracas, the pyramid-like structure jutted impressively from the surrounding neighborhood. Unfortunately funding for the project ran dry in the 1960's and work on the site slowed to a trickle despite the inclusion of a Buckminster Fuller geodesic dome which was placed like a cap atop the hill. Eventually the Helix was completed as six concentric levels of the building were built onto the shelves carved out of the hill. 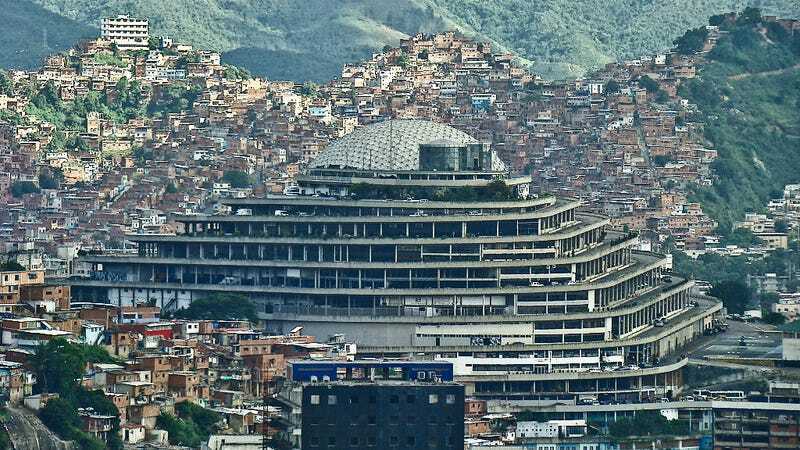 With the dream of an easily accessible mecca of retail and luxury scuttled due to money woes, the Venezuelan state began using the space for a number of its agencies. Finally this centralization of government power made the site the target of a damaging bombing in 1992. However the structure was rebuilt and the whole complex is now home to the Directorate of Intelligence and Prevention Services (DISIP). This secretive intelligence agency has made headquarters in the eccentric building and has also started a not-so-secret prison at the site. Like many such shadowy containment facilities, the prisoners are often held without charge and have reported myriad human rights abuses from within the iconic building. In the real world, most shady government agencies try to remain under the radar, but the shadow agents of The Helix seem to have taken a page from a different book. Probably a comic book.